Provide comfort for the family of Ascension Espinoza with a meaningful gesture of sympathy. Ascension "Shawn" Espinoza, 71 of Snyder, passed away Friday, February 1, 2019. 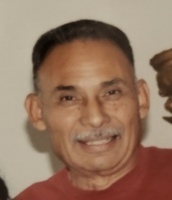 A Funeral Mass for Mr. Espinoza will be held Wednesday, February 5, 2019 at 10:00 a.m. at Our Lady of Guadalupe Catholic Church with Deacon John Bane officiating. Burial will follow in Hillside Memorial Gardens Cemetery, A rosary service will be held Tuesday, February 4, 2019 at 6:00 pm at Miller Family Funeral Home Chapel. Mr. Espinoza was born May 15, 1947 in Beeville, TX to Santos and Felicita (Garcia) Espinoza. To send flowers in memory of Ascension Garcia Espinoza, please visit our Heartfelt Sympathies Store. We encourage you to share your most beloved memories of Ascension here, so that the family and other loved ones can always see it. You can upload cherished photographs, or share your favorite stories, and can even comment on those shared by others.